At the meeting, innovation projects for more than five million U.S. dollars were approved to support small producers in the region. (Buenos Aires, September 29, 2016) From September 29 to October 1 FONTAGRO’s Board of Directors is holding its Twentieth Annual Meeting in Buenos Aires, Argentina, where representatives of more than 15 countries meet to discuss several aspects and investments regarding agricultural research and innovation. FONTAGRO is a regional cooperation mechanism. 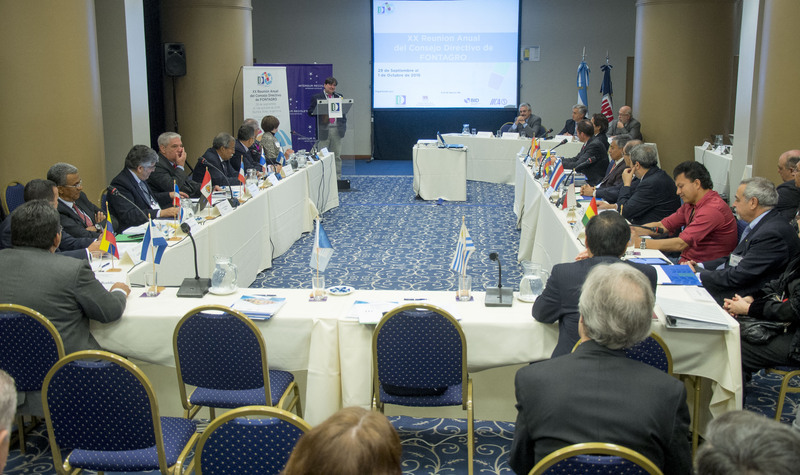 The meeting is hosted by Argentina’s National Agricultural Technology Institute (INTA) and attended by its president, Mr. Amadeo Nicora; representatives from Argentina, Bolivia, Chile, Costa Rica, Colombia, Dominican Republic, Ecuador, Honduras, Nicaragua, Panama, Paraguay, Peru, Spain, Uruguay, and Venezuela; and representatives from Mexico and Guatemala, as special guests. During the meeting, several initiatives on family farming innovation were presented and regional projects were approved. These projects arose from the 2016 Call for Proposals to promote innovations in family farming in order to facilitate market access for small producers. They included successful case studies on farmers’ entry into markets, spearheaded by Argentina, Bolivia, and Spain; technologies for growing Andean cacao, spearheaded by Colombia and Peru; and developing microeconomies for the production of essential oils on mining soils, spearheaded by Argentina and Colombia; as well as a project to improve the competitiveness of Andean fruit, spearheaded by Colombia, Ecuador, and Spain. Progress on the following projects was also presented: the project on the sustainable intensification of the dairy sector, which involves at least 12 countries; the beekeeping and farming project in three countries in the Gran Chaco, spearheaded by Argentina; and the project on developing new initiatives on intensive horticulture in protected environments, impact assessment indicators, and bioeconomy. Participants on behalf of FONTAGRO’s sponsors included Bernardo Guillamon, Gustavo Beliz, and Salvador Fernández. Mr. Guillamon, Engineer, confirmed the Inter-American Development Bank’s support and highlighted the potential partnerships that can be generated through FONTAGRO’s innovation platforms, as well as the scaling up of current FONTAGRO projects in order to reach more producers, and partnerships that can be established with the private sector, especially with consumer goods companies, to integrate innovations into markets via their products. Mr. Beliz, PhD, also distinguished FONTAGRO as a mechanism for dialogue among countries and presented regional integration opportunities through the Institute for the Integration of Latin America and the Caribbean (INTAL), headquartered in Buenos Aires, which he heads. Mr. Fernández, PhD, representing the Inter-American Institute for Cooperation on Agriculture (IICA)—a FONTAGRO sponsor—stressed the importance of FONTAGRO’s sustainability and the inclusion of nonmember countries, such as Mexico and Guatemala. Within the framework of the meeting, Costa Rica signed an agreement to increase its capital for FONTAGRO and Guatemala announced that it has begun the process to join FONTAGRO as a member country. Capacity building was a central theme, in which countries expressed the need to have more human resources for agricultural research and innovation, as well as the need to seek more investment in this area. The meeting involves a technical visit to the National Center for Agricultural Research in the city of Castelar, to see the latest innovations carried out by INTA Argentina, as well as a visit to the genetics institute, the floriculture institute, and the climate and water institute, which are located in the same complex. Lastly, FONTAGRO’s president highlighted “countries’ unity,” since they work jointly within the framework of FONTAGRO toward improving family farming in the region and bringing innovations to their communities, to benefit small farmers. For more information, please email ccarrasco@iadb.org. FONTAGRO is a unique regional cooperation mechanism that promotes family farming innovation, competitiveness, and food security. It was established in 1998 and it includes fifteen member countries that have contributed a capital of some $100 million. FONTAGRO is sponsored by the Inter-American Development Bank (IDB) and the Inter-American Institute for Cooperation on Agriculture (IICA). Its Technical Administrative Secretariat is based at IDB headquarters in Washington, D.C. FONTAGRO has cofinanced more than 100 projects and initiatives in its member countries for an approximate amount of $88.7 million, including contributions from other sources of funding and executing agencies. Its member countries are Argentina, Bolivia, Chile, Colombia, Costa Rica, Dominican Republic, Ecuador, Honduras, Nicaragua, Panama, Paraguay, Peru, Spain, Uruguay, and Venezuela.